Our client Technology Effect and Sydney-based Breeze, were joining forces and being purchased by ASX listed company Montech Holdings. The new company firstly required a name, one that was indictitive of the combined intention of the two companies and one that would reflect Montech Holdings role in the merger. Thus MOQdigital was born from the combination of digital as what the new company would provide and MOQ from the Montech Holdings share code. An aspirational positioning statement that creates a future for the company to live into was also needed, as well as a new logo and a full brand roll out. Elements design for MOQdigital included a full suite of logos, business cards, pull up banners, landing pages and a finished website, letterhead and powerpoint templates, plus Outsource2Us provided an outsourced team to implement a ‘go to market’ strategy. 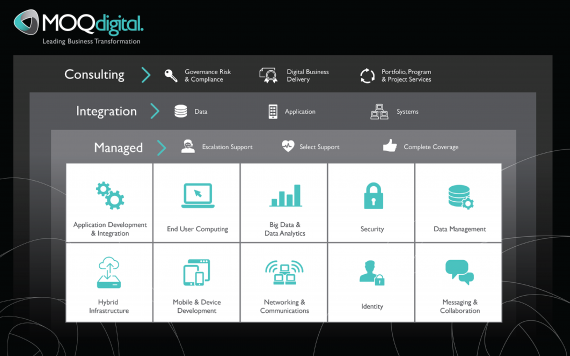 MOQdigital’s cloud based solutions harness the best of digital technologies, yet importantly they provide the infrastructure to support them. They work with companies to transform them to digital businesses and provide the smart technology solutions needed to support those organisations in times of rapid change and growth. We put in place an outsourced CMO to set the strategy and lead the marketing team. Also a digital marketing manager to drive the social media, content marketing and eDM strategy and content. For launch an exclusive interview was organised with the Australian, and we created a video of the CEO and COO discussing the way MOQdigital take clients on a journey to the Cloud, which was used across social media and shown on TV screens internally at Microsoft (one of MOQdigital’s key vendor partners). We developed a range of pull-up banners for use at events and in-house and Outsource2Us rebranded all collateral, case studies, capabilities statement and importantly a fully functioning website and adjoining microsites. A strong name, brand and positioning, well received by all. A coordinated launch to the market that has MOQdigital well known in Brisbane and Sydney IT. Social media platforms – a voice and a community. Jack is our Website Development Manager, and is responsible for designing, implementing, supporting client websites and provides IT support.